A High Court sitting in Port Harcourt, the Rivers State capital, has sentenced the Managing Director of Shell Petroleum Development Company, Mr Osagie Okunbor, and two other top officials of the oil firm to three months’ imprisonment with hard labour for contempt. Nike Onyilola, who is the SPDC Secretary and Head of Legal Department; and Keibi Atemie, who is the Deputy Country Head of Legal/Managing Counsel, Global Litigation, Sub-Sahara Africa. Delivering judgement on Tuesday, the presiding judge, Justice George Omereji, said the three persons were convicted for refusing to obey a court order in 2008 instructing them to forfeit land where Bonny Crude Oil terminal was located. The court order, according to Justice Omereji, was given 10 years ago by Justice Margaret Opara of the Rivers State High Court. It was gathered that the said land belonged to the Jumbo Major House of Bonny and the Brown House of Finima in the Bonny Local Government Area of Rivers State. Though the convicted Shell officials were not in court, Justice Omereji instructed the police and other law enforcement agencies to arrest and send them to prison. 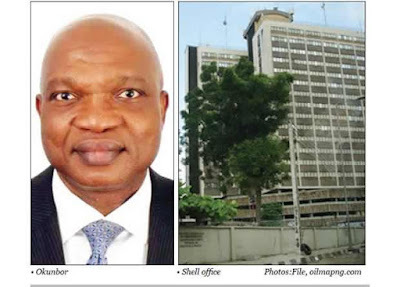 The Jumbo Major House and Brown House, who are all landlords to Shell in the Bonny LGA had approached the court and complained about the tenancy and compensation for their land. It was also learnt that Justice Opara had in 2008 instructed that Shell should give up the Bonny terminal for violating the terms of tenancy and surreptitiously getting a Certificate of Occupancy from the then government of Rivers State for the said land. Thirty percent of Nigeria’s crude oil is said to be produced and exported from the land owned by Jumbo Major House of Bonny and the Brown House of Finima. Shell had after the ruling in 2008 gone to the Appeal Court, lost the case, and went to the Supreme Court, where it also lost. The right thing would have been to obey the court.